Some satisfying deliveries arrived today as well as a few belated gifts from a family member. 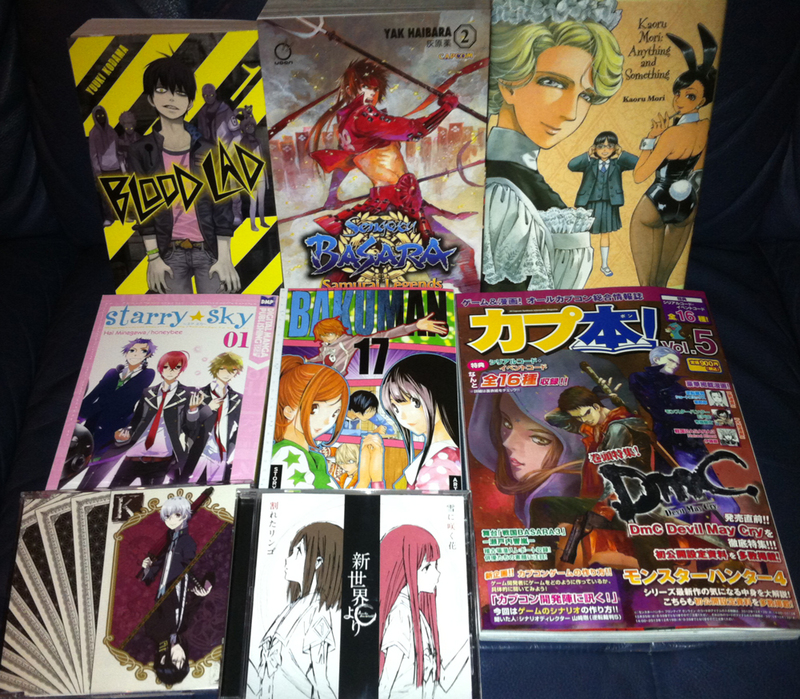 Most of the new arrivals took the form of manga, with the first volumes of the English versions of Starry Sky and Blood Lad joining Bakuman. volume 17. 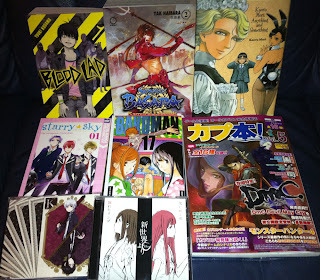 Mori Kaoru's Anything And Something short story collection and the second volume of Haibara Yak's Sengoku Basara 2 manga complete the top row. The magazine in the bottom right is the fifth volume of Capbon, the 'All Capcom Synthesis Information Magazine'. It contains a variety of Capcom-related manga, including a chapter of Sumeragi's Mame Sengoku Basara and another from Itou Ryuu's series Sengoku Basara 3 Naked Blood - starring a young Ieyasu. There's also a generous helping of news reports and previews for all kinds of Capcom games. The backstage photo report from Butai Sengoku Basara 3 ~Setouchi Kyouran~ made me want the DVD version more than ever. Finally, I also received two CD singles: angela's 'KINGS' (the opening theme from K) and the Shin Sekai Yori ending theme CD. I'd ordered this back when it was originally listed for Taneda Risa's gorgeous outro 'Wareta Ringo', so it was a pleasant surprise to find it also included the second ending song by Hanazawa Kana, 'Yuki Ni Saku Hana'. It's time to start reading!